Behavior Management on the GO! As most of you know, I am subbing in k-4 classrooms this year. I have to say, it really isn’t so bad. The worst thing about subbing is wishing I was in my own classroom again… That part is depressing, but the rest is pretty fun and happy. Since I had years in my own classroom, I think subbing is somewhat easier than when I went into subbing when I first started teaching back in 1997. I also think being a parent of younger children also makes you have a different perspective on the teaching job (but that is a whole post by itself). I have many tips and tricks that have been helpful to me this go around while subbing. I look forward to sharing them here on the blog and on the Teaching Heart subbing page which is already filled with resources. Click her to see that. 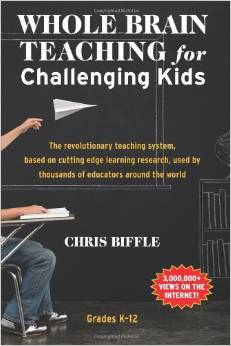 This summer I read Whole Brain Teaching for Challenging Kids: (and the rest of your class, too!) ! Loved it and began researching the benefits of Whole Brain Teaching!!! I know that all of the strategies and resources used in the book will become part of my future classroom. However, there was one part of the system that I knew I could surely use while subbing to be sure the kids were motivated and on task. I knew the Whole Brain Scoreboard Techniques was for me and would work in any classroom I visited. It’s behavior management on the go! I began using it right away in first, second, and third. I have been in Kindergarten many times this year, I feel the classes I am in are all pretty well behaved and motivated and this techniques was not needed for those classroom. Although if I did end up teaching my own Kindergarten classroom, I would definitely use this strategy on a modified basis. I have not had one bad class this year and I give credit to my scoreboards for a stress free classroom for me! Let’s be honest… subbing is more about behavior management then anything else. Often it is paid babysitting by a certified teacher. If you do not have the kids behaving, then learning does not happen and the substitute teacher is just wishing the day would end. As a substitute you will find that SOME teachers will leave you the rules to their behavior management plan… clip chart or other…. I find the majority do not leave me clear information on how they use their system. I use the scoreboard system in all first through third classes I am in. If a teacher did leave clear information on their behavior charts or plans then I will use their behavior management plan along with the scoreboard system. The WBT website states: “The Scoreboard, described in the “First Steps” menu, is your initial and primary motivator. 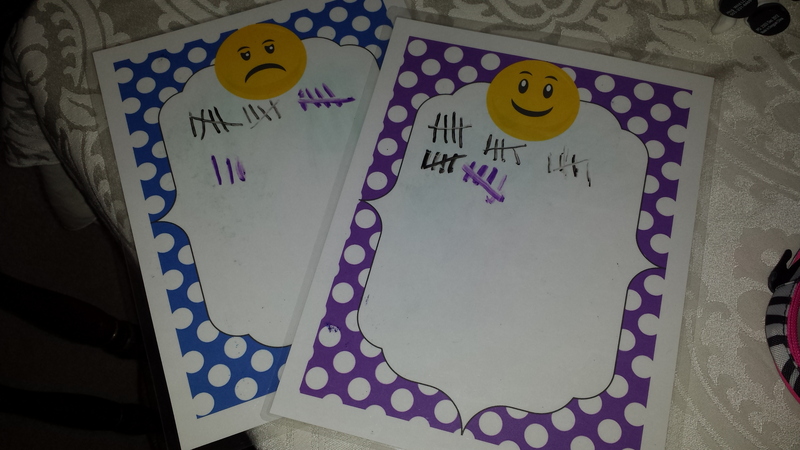 For K-4th graders, use Smilies and Frownies as your categories; for older students we’ve found Teacher vs. Students works wonderfully well.” I use smiles and frowns as my scoreboard when I sub. Here are my boards below. I made them from graphics I purchased and then laminated them so that I can just clip them with a magnet to the boards in the classrooms I teach. They can be erased after each class since they are laminated. I can also moved the scorecards around the room when I change positions in the classroom. They can come with me as a visual for the kiddos. I use this system in first, second, and third grades. Basically, I display the boards and tell the class that we are going to play a game all day…. The game is called SMILEY and FROWNIE. You can earn smiles by being on task, being quiet, and pleasing me. You earn frowns when things get too loud or you are not acting as you would when your regular classroom teacher is here or if you aren’t making me happy. Throughout the day I will look to see if you have more smiles than frowns. If you have more smiles we will stop and play a game or take a break to dance. At the end of the day if you have a larger number of smiles, we will save the last 10 minutes of the day to have fun playing a game. This always works fantastically for me. I have never had a class that had more frowns than smiles. I constantly praise positive behavior with words and a tally on the smile side. I love the way you are being quiet and working on the assignment. I love the way you all are participating in the lesson. If things are not going the way I had hoped, it usually only takes one frown for the class to perk up and act the way they should. Oh no, it is getting loud in here… I am giving you a frown. Table 3 is too busy talking rather than listening… I am giving you a frown! If you are quiet in the hall to music class and I hardly know you are behind me, I will give you 5 smiles when we return. If I hear you behind me, I will give you seven frowns when we return. There are many ways you can use this. Many of the classes I have on repeat occasions remember the number of smiles they had the last time they had me and they try to beat that number. Also, classes will often ask me what the most number of smiles a class has gotten and they try hard to beat that record. I always keep a sticky note of the name of the class that was in the lead for the number of smiles. I also keep a list of classes who earned less than three frowns for the day. The link below is a YOUTUBE example of the scoreboard being used in a classroom. More resources and information on Whole Brain Teaching can be found at the many link here! Ideas for more smiles than frowns! TPT has many free scoreboards you can print. Check some out here! If you are subbing and looking for an easy behavior management to take on the go, this is it! It has saved my sanity as a guest teacher! For more Guest Teacher Ideas, click HERE! Two To Print Free for Back to School!! !